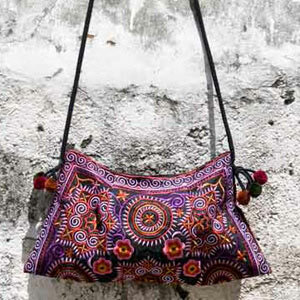 Lavish colors and dark flowers bring tribal elegance to this shoulder bag from the Hmong minority women. 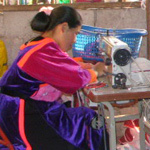 Embroidered in multi-colors, the floral composition evokes hill tribe artistry. The interior is lined with cotton and has a zipped inner pocket. 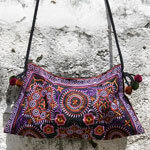 The bag closes with a zipper and features pompoms on the sides. A stylish ethnic addition to any outfit.